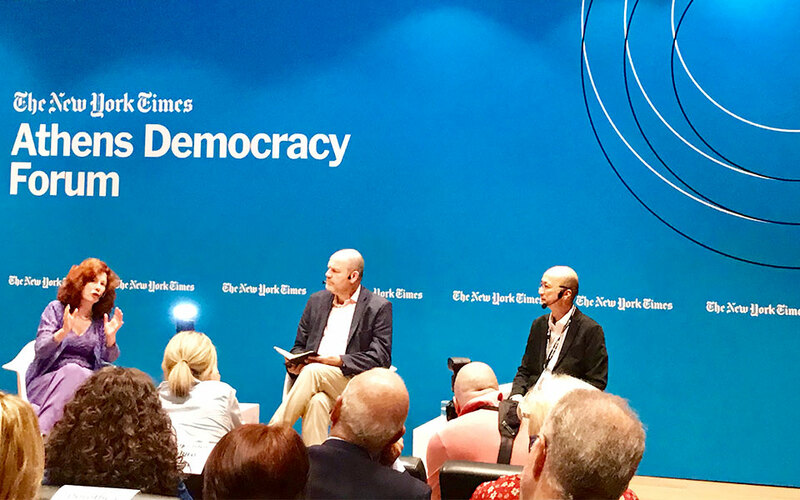 The 6th New York Times Athens Democracy Forum opened with a fascinating dialogue between Eastern and Western philosophy. 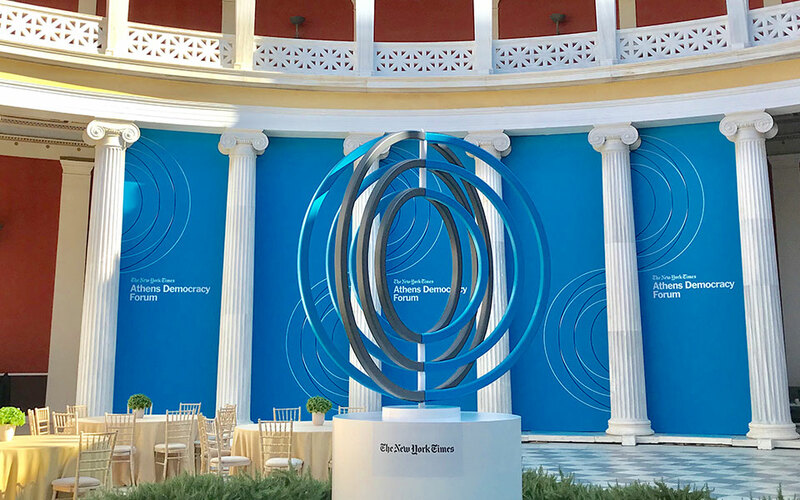 “Is what is old, new again?” A timeless question heralded the advent of the sixth annual Athens Democracy Forum, convened by The New York Times and aiming to dissect democracy’s biggest challenges in its very birthplace. In the shadow of the Parthenon on Sunday afternoon the Acropolis Museum’s auditorium was brimming with life as participants gathered to attend “a Socrates-Confucius dialogue” – a fascinating introductory event that consulted the classical philosophical sages of East and West in order to find new insights and reboot today’s democracies. The sharp reasoning of the great Greek philosopher was brought to life with wit and theatricality by Professor Angie Hobbs from the University of Sheffield, while across the stage, Professor Joseph Chan from the University of Hong Kong represented the wisdom and sincerity of Confucius. 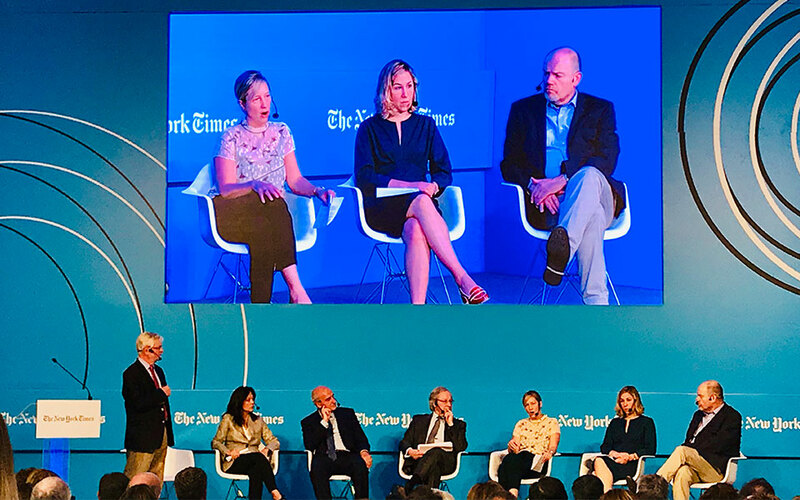 The discussion was moderated by Mark Thompson, president and CEO of The New York Times Company, who emphasized the importance of the press as “a hyphen between the demos (people) and the kratos (state),” before posing a number of challenging questions that led to an hour of lively debate. Things took an interesting turn when the moderator brought up the anonymous op-ed recently published in The New York Times that described the internal resistance within US President Donald Trump’s administration. “What would be the honorable thing for a politician to do when faced with a bad ruler?” asked Thompson, as the theater erupted in applause. Professor Chan referred to the consequentialist thinking of Confucius, and emphasized the need to balance one’s principles with the maximization of the common good. Professor Hobbs was more laconic in her response. “I would continue to be critical and practice my civic responsibilities even if a corrupt regime sentenced me to death,” she said bluntly. When asked about the importance of experts and technocrats in today’s liberal democracies, the professor evoked the critical spirit of Socrates found in texts such as “Gorgias” and the famous “Apology.” “We should always corner and question those who claim expertise, but not the necessity of it in government,” she said. Chan, in turn, used Confucian thought to analyze the challenges brought about by globalization, as states increasingly compete for the management of resources and talent. “We need a strong leadership solution – but the real challenge is ensuring that a leader is accountable to the people he or she represents,” he concluded, before lamenting the lack of an ideal head of state and emphasizing the need to cultivate a virtuous and responsible political elite. In her concluding remarks, Hobbs seized the opportunity to comment on the rise of demagogues and distortion of today’s democracy. “Beware of anyone who claims to channel the will of the people – as if there is only one,” she declared passionately, as she warned of the dangers of divisive rhetoric and appeals to fear and resentment. As the fascinating conversation that honored the beacons of Western and Eastern thought came to an end, participants were given a tour of the Acropolis Museum. It was an especially appropriate cultural twist to the opening night – apart from the impressive ancient Greek exhibits, the museum is also currently hosting 154 items from the private quarters of Emperor Qianlong, on loan from the Forbidden City in Beijing. 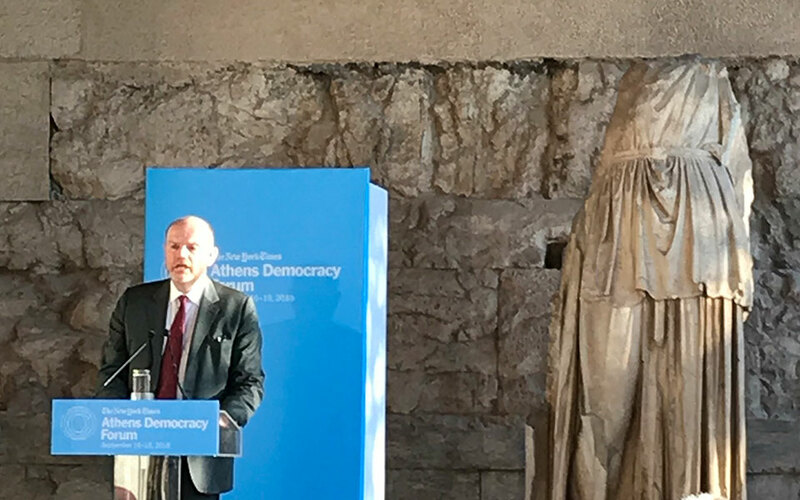 At dusk, the opening day of the Athens Democracy Forum came to an end with the presentation of the 2018 Democracy Prize. This year’s recipient was Joaquim Alberto Chissano, former president of the Republic of Mozambique and chairperson of the Joaquim Chissano Foundation. Athens Mayor Giorgos Kaminis presented the award to Chissano after praising his lasting contribution to the transformation of his war-ridden country into one of Africa’s most successful democracies. After an excellent evening, the Athens Democracy Forum continued with two days of intense reflection on the challenges and opportunities of today’s liberal democracies. A series of fascinating talks dug deep into issues ranging from the perils of digital misinformation to the challenges of migration – a very contemporary agenda that nonetheless was examined through the lens of great classical thinking.